Spotted this product at CVS yesterday as I was looking for some hair wax/pomade and couldn't resist picking it up. 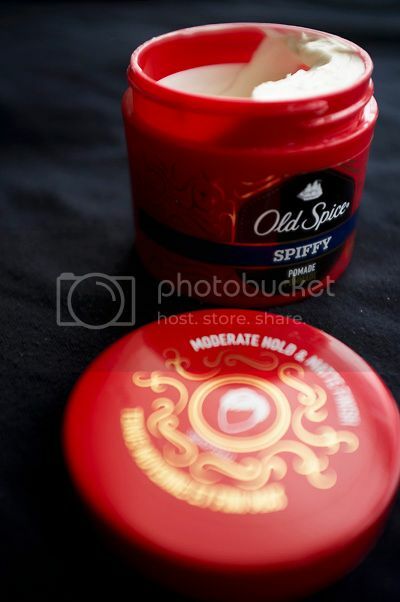 I mean..just the idea of having my hair smelling of Old Spice was just too compelling..and odd to not give it a go. Very weak unfortunately and yes it has a vague Old Spice smell to it but if no one had told me that's what it was I'm not 100% sure I would had been able to guess it. Not bad, not great. Kinda middle of the road. For $8 you can probably do better out there. That is a great looking container! (04-04-2014, 12:56 PM)celestino Wrote: That is a great looking container! I think the first time I used this pomade my hair was still too wet when I applied it. I've been using it for the past two days in my hair when it's just damp and the pomade actually works really, really well. I'm liking it! Great stuff!! My hair is short and a little longer on tip. I apply when my hair is towel dry good hold. Yeah I really like it now. Totally agree. How about a blade bank?